For the past several years, decades even, the annual summer movie season kicks off on the first weekend in May, which is when many colleges and universities end their school years. The summer season typically lasts until the last weekend in August, with the Labor Day holiday weekend typically signifying the start of the fall movie season. 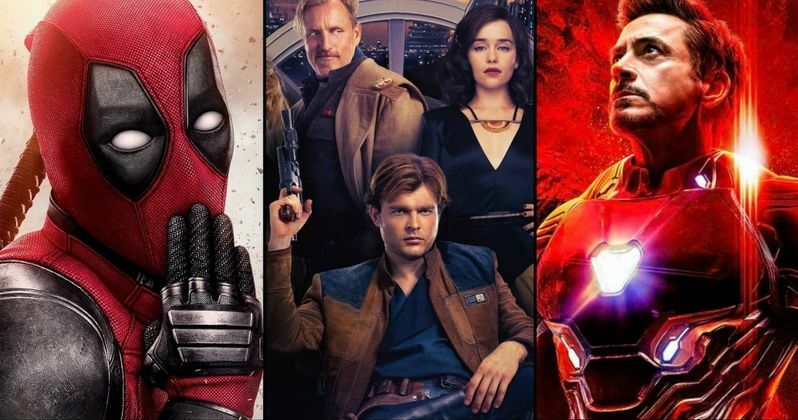 This year, summer started a weekend earlier with the April 27 release of Marvel's highly-anticipated Avengers: Infinity War, so we decided to break down the entire summer movie season and try to predict the top 10 movies at the box office this season. For the past four years, the summer movie season has kicked off with a Marvel Studios adventure. Avengers: Infinity War follows Guardians of the Galaxy Vol. 2 from last year, Captain America: Civil War in 2016 and Avengers: Age of Ultron in 2015. Many were quite surprised when Marvel opted to move Avengers: Infinity War out of its plum May 4 release date, pushing it to April 27, since the last weekend in April is traditionally one of the worst box office weekends of the year. Still, the Marvel Cinematic Universe is so huge by now, it could open its movies on any day they want and they'll still be huge hits. While no rationale was given for the release date shift, it's possible that it was in response to 20th Century Fox moving the date for Deadpool from June 1 to May 18, with Marvel possibly giving Avengers: Infinity War an extra week in theaters to give it some space between Deadpool 2. But Avengers: Infinity War isn't the only blockbuster-to-be to debut during these summer months, with a slew of highly-anticipated sequels, a Star Wars spin-off and *gasp* even a few original movies thrown in the mix as well. I know, it may sound crazy to have an actual original movie debut during the summer months, but low-budget original hits like Get Out and Split last year, just to name a few, served as a sign that originality isn't quite dead yet in Hollywood. On my top 10 list, I have two original movies that weren't based on any existing intellectual property (IP), and while they are in fact at the bottom of the top 10, they should still fare quite well this summer movie season. With all of that being said, we are going to present our picks for the top 10 highest grossing movies of the summer 2018 season, in reverse order. We'll be predicting both the opening weekend tallies and the domestic gross, although the numerical ranking will be based on the domestic gross total, and we are not factoring in international or worldwide grosses. Take a look at our top 10 below, starting with one of the two original movies on the list. The first trailer for this action-comedy was rather well-received, and despite debuting in what is currently the most crowded weekend of the summer, with five new releases, The Spy Who Dumped Me is shaping up to be a late summer sleeper hit. The story follows Audrey (Mila Kunis), who learns that her ex-boyfriend (Justin Theroux) who recently dumped her, is actually a CIA spy, and now the dangerous men who are after him, are now after her, and her best friend Morgan (Kate McKinnon), sending them on the adventure of their lives. The supporting cast is solid as well with Sam Heughan, Gillian Anderson and Fred Melamed, and we think writer-director Susanna Fogel's comedy will help bring the summer season to a close with a bang. $24.6 million opening weekend, $165 million domestic. Warner Bros. turned their 2001 remake Ocean's Eleven, based on the 1960 movie of the same name, into a hit trilogy with 2004's Ocean's Twelve and 2007's Ocean's Thirteen. While many had wondered when the studio would simply reboot the franchise, they went in a different direction with Ocean's 8, following an all-female team of thieves lead by Sandra Bullock's Debbie Ocean, the sister of George Clooney's Danny Ocean. While Clooney returns to produce, it isn't believed that Danny Ocean will have a cameo, although there have been rumors that he will, while other stars from the original trilogy have been confirmed like Matt Damon's Linus Caldwell and Carl Reiner's Saul Bloom. With this impressive female cast that also includes Cate Blanchett, Anne Hathaway, Helena Bonham Carter, Mindy Kaling, Sarah Paulson, Rihanna and Awkwafina, the ladies (and gentlemen) will likely come out in full force for this heist thriller, following these characters trying to pull off a heist at New York's famed Met Gala. The movie's chances for success are bolstered even further by the fact it only has one movie it's competing against in wide release, A24's Hereditary. $31.4 million opening weekend, $210 million domestic. Dwayne Johnson has been on an incredible run as of late at the box office, with seemingly everything the man touches turning to gold... with the exception of Baywatch. Most didn't expect Jumanji: Welcome to the Jungle to have the incredible success it did ($404 million domestic, $954.6 million worldwide) and Rampage, which opened last weekend, is performing better than expected as well. The Rock returns to multiplexes everywhere this summer with Skyscraper, which reunites the actor with his Central Intelligence writer-director Rawson Marshall Thurber, with his script sparking a bidding war ultimately won by Legendary. Johnson stars as Will Sawyer, a former FBI agent who now assesses security risks, and he finds a lot of them in the world's tallest building, which just so happens to catch on fire while he and his family are in this massive structure. This should be another big hit for The Rock. $39.3 million opening weekend, $275 million domestic. Just a few months after Avengers: Infinity War hits theaters, Marvel will bring its third 2018 movie to theaters, Ant-Man and the Wasp. While the first movie certainly wasn't a huge hit, ranking 16th of the 18 MCU movies at the domestic box office with $180.2 million, Paul Rudd's title character also appeared in the blockbuster Captain America: Civil War, where we got to see the opposite of Ant-Man, Giant Man, do battle during the iconic airport fight. With this upcoming sequel, we think there will be much more interest in these characters this time around, with Paul Rudd returning alongside Evangeline Lily as Hope Van Dyne/The Wasp, Michael Douglas as Hank Pym, Michael Pena as Luis, T.I. as David, David Dastmalchian as Kurt, Judy Greer as Maggie Lang and Abby Ryder Fortson as Cassie Lang, along with several franchise newcomers. Hannah John-Kamen has come aboard as Ghost, with Walton Goggins portraying Sonny Burch, Laurence Fishburne as Dr. Bill Foster, Randall Park as Jimmy Woo (which could mean the newly-legitimized S.H.I.E.L.D. will surface) and Michelle Pfieffer as Janet Van Dyne, Hope's mother. With all of these new characters in place, and the fact that this sequel falls between Avengers: Infinity War and Avengers 4, we think Ant-Man and the Wasp should far exceed its predecessor. $60.2 million opening weekend, $310 million domestic. Tom Cruise returns as Ethan Hunt in Mission: Impossible - Fallout, the sixth installment of this blockbuster franchise, with this movie poised to be the biggest of them all, in more ways than one. While this franchise has been successful, it hasn't broken out with massive blockbuster numbers, with the highest-grossing film in the franchise domestically still 2000's Mission: Impossible 2 ($215.4 million) but we think all the pieces are in place for Fallout to break the $300 million mark. For one, it doesn't have much competition around it, debuting against just one other movie, Warner Bros.' animated superhero comedy Teen Titans! Go to the Movies, and none of the other movies around it seem to offer much competition. This movie will also reportedly feature Tom Cruise's biggest and most impressive stunt ever, which could certainly draw more to theaters than previous installments, although many wonder how Cruise can top the huge stunt from Rogue Nation, where he held onto the door of a cargo plane as it took off. While the franchise has been the model of consistency, we think this one could take the franchise into the stratosphere. $72.6 million opening weekend, $350.7 million domestic.